Great Eclipse. Really. What else could I name this post? But it does make me feel like I should go get a haircut. I only decided a few days in advance that I kind of wanted to go experience a total solar eclipse. I’ve experienced a few partials in the past, but aside from a chip being taken out of the sun, there wasn’t much more for those. Fortunately, I didn’t have to do too much planning. You see, I knew that southern Illinois had a bald cypress swamp that I’d been interested in visiting. In fact, I’d even considered the area in the Shawnee National Forest as an overnight stop-over point for a trip Out West. So, I’d already collected a fair bit of information. So, I headed out there on Thurday, figuring that would be the best time to try to get a regular campsite. 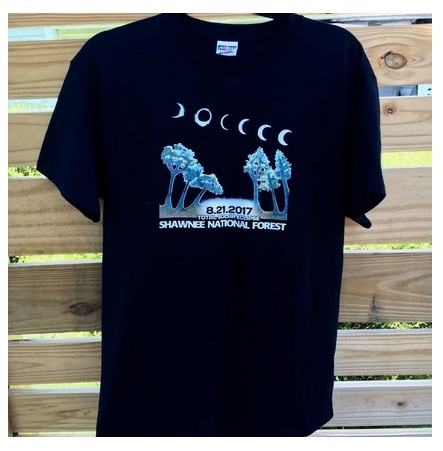 I knew the Shawnee folks were working hard to create additional temporary campsites in time for the eclipse, but I really didn’t want to deal with that if I could help it. It worked out just fine for me. On my way in, I made a last-minute decision to see if I could get a campsite at the Garden of the Gods (eroded sandstone features similar to Hocking Hills—more on these in a later post), but by the time I got there (around 4:00pm) they were filled. There were only 12 spots, after all. So, I continued down to Lake Glendale and got one of the remaining 5 or so official campsites. This location wasn’t quite as spectacular as Garden of the Gods, but it was comfortable and well-located: about a mile from the center line of the eclipse. 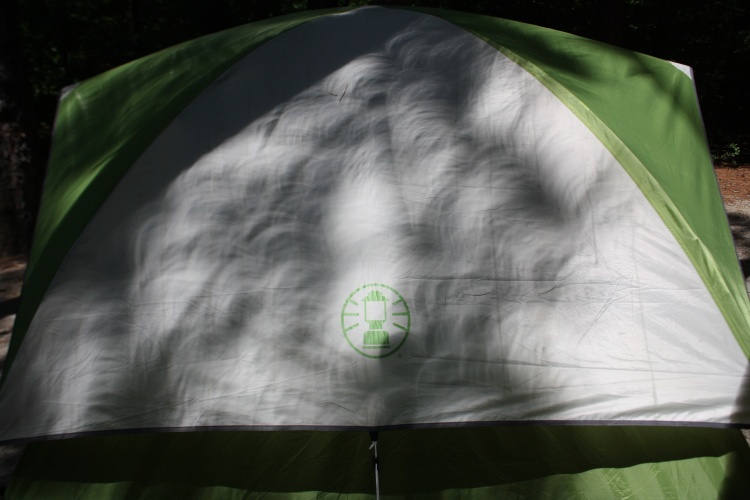 In fact, from my campsite, I saw an opening that I figured would be more than sufficient to see the eclipse. Can I See the Eclipse from Here? This was produced by the Friends of Shawnee National Forest. And I visited, along with my canoe, the bald cypress swamp at the Cache River State Natural Area. You can’t really visit a swamp without a canoe (or kayak). I’ll write this up in a later blog post. Suffice it to say it was almost better than the eclipse. On Saturday, I did some hiking, again in the Cache River area. At this point, the “overflow” was starting to occur at Lake Glendale. Here’s a shot of the picnic area, where folks (with National Forest blessing and guidance) were starting to set up. 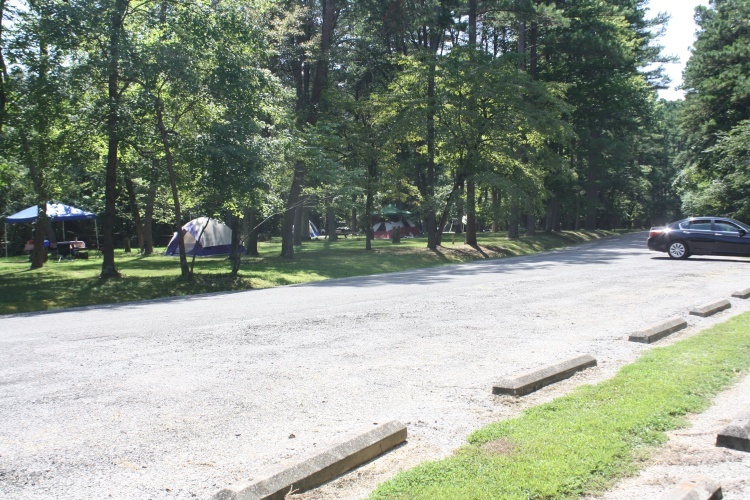 People were also setting up right along the road to the “official” campground. And on Sunday, I headed over to the Garden of the Gods to do some hiking over there. That place was a madhouse. There were people everywhere. 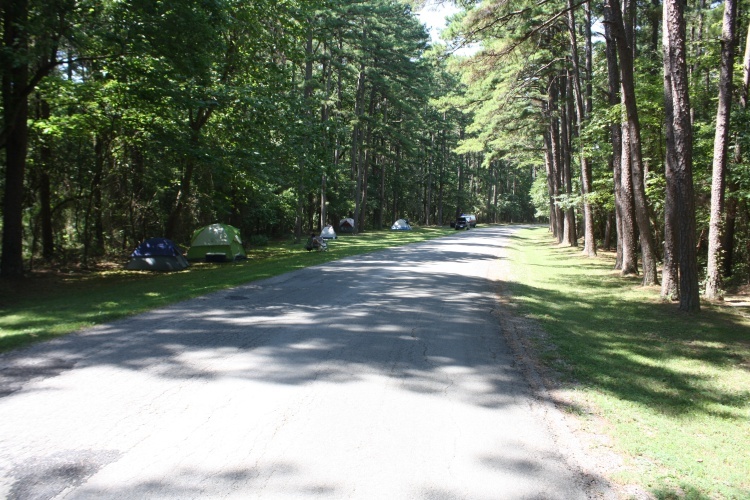 You see, as a National Forest, you are allowed to do “primitive” camping just about anywhere as long as you get you car off of the road (and as long as it is really National Forest land, not a private landowner). And people were really taking advantage of that, though they weren’t necessarily doing a good job of getting their cars off of the roads. As I was hiking, I was encountering backpackers who were heading backcountry to view the eclipse. As I said: madhouse. Here’s a news article about it: Shawnee National Forest areas temporarily close due to overcrowding. Things were really starting to fill in at Lake Glendale, too. Here’s some video I took on the way back in (around 3:00pm Sunday) to my campsite. You can see the FULL sign at the entrance, and then I head down the road to the campsite. It gets crowded right around the picnic area (about the 0:40 second mark). At the end, when I turn left into the official campgrounds, you can see a truck head straight to even more temporary campsites. Then Eclipse Day arrived. What did I do? I went canoeing on Lake Glendale. The eclipse didn’t start until 11:53:44.8 and I had time to kill. So I explored the lake, and got to watch a lot of people setting up in the parking lot or along the dam. I’d already decided just to watch from my campsite, so I wanted to stay somewhat close and not get caught up in any traffic of people trying to get elsewhere. We were concerned a bit about the weather. The forecast was for “partly cloudy” and suggested a fair bit of cloud cover. The day started out nicely (and was clear while I was canoeing). 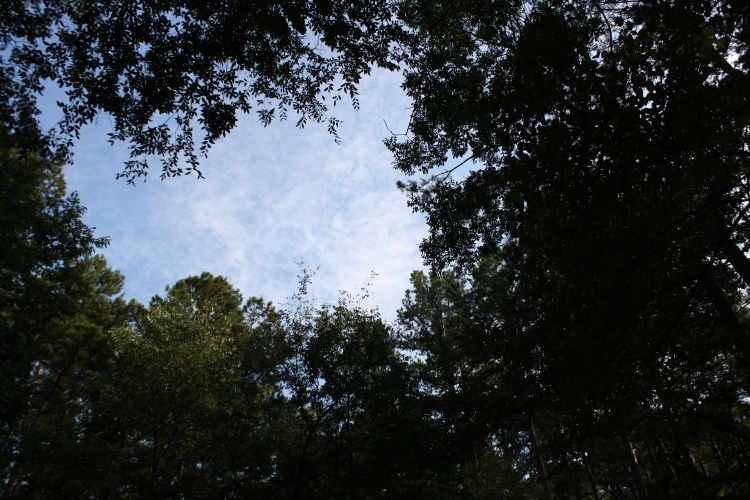 But as eclipse-time approached, there were a fair number of puffy clouds obscuring the sky. Oops. And as the eclipse progressed, those clouds seemed to be getting thicker. 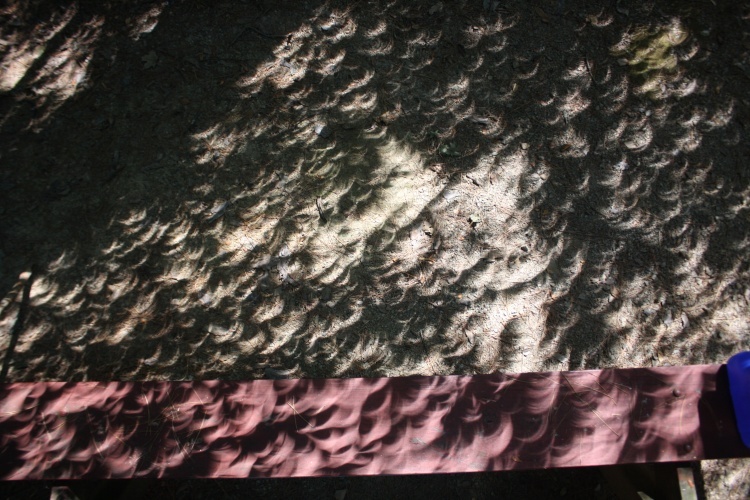 I knew the first thing to look for (aside from watching with my eclipse glasses) was the pinhole camera (or camera obscura) effect, which is that as the eclipse progresses, the crecsent shape of the remaining sun would be exposed in the light dappling through the gaps in the leaves of the trees. 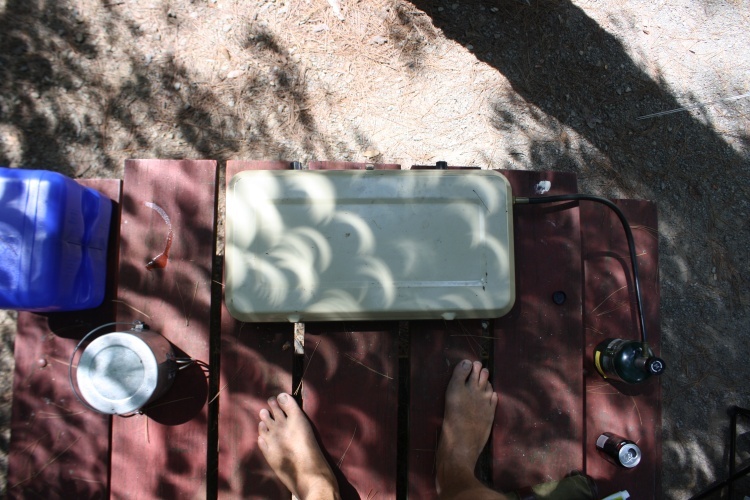 Here’s my first picture of that, taken while standing on my picnic table and looking down on my (closed) camp stove. This was taken at 1:57, about 24 minutes before the start of totality. Here’s another picture, taken at 1:08 (13 minutes pre-tot). By now the sky had cleared completely. Amazing. So here’s another picture, of just the side of my tent. The crescents really stick out. At this point I got concerned; were thin clouds returning and ruining the eclipse? It was getting darker. And then totality. I could hear the crowd over at the dam put out a roar. Not the best picture. But it is mine. 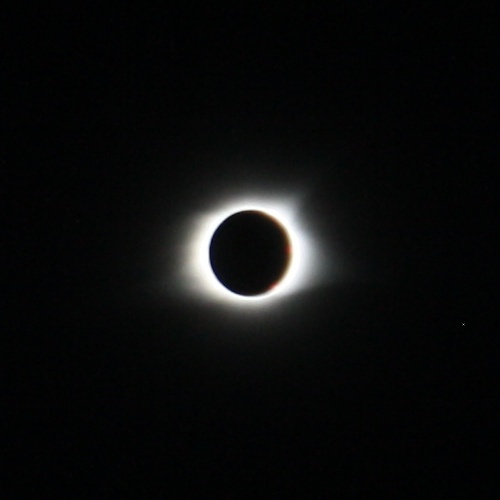 I also had to try to enjoy the totality itself and not waste the 2 minute 40.1 second experience screwing around with my camera. OK, I wasted a bit of it, to get this shot with a somewhat better exposure (though now a bit too dark). But I was watching when the sun re-emerged. Suddenly a sharp diamond appeared on the right side of the darkness, gorgeous to look at, and then a millisecond later my eyes said “ow, ow, ow” and I looked away as that little of bit luminal energy bit exponentially exploded to way more than what a simple biological entity could look at directly. From then on it was a bit anti-climactic. Yes, the sky brightened and the chip on the sun slowly moved away. But it was the reverse of what we’d already seen (I still checked periodically to see how it was coming). And then it was time for everybody to make their big escape. Here’s an article from the Chicago Tribune about the awful traffic jams of people trying to head home: After viewing eclipse downstate, long trip back home anything but stellar. 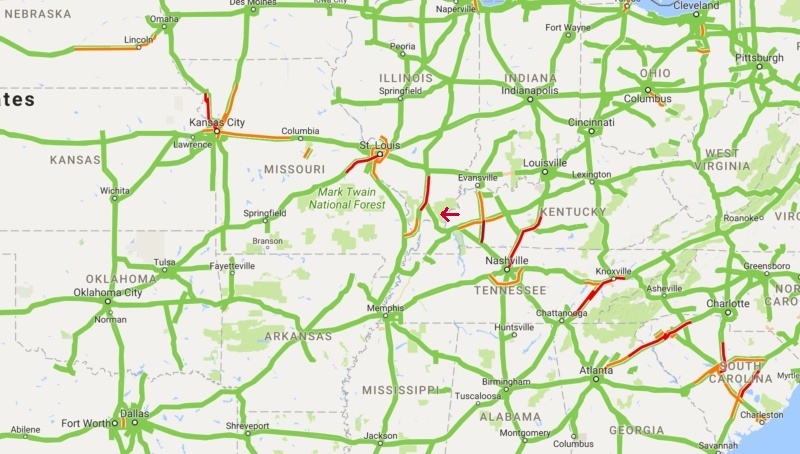 I like this article, with accompanying picture, even better, as it shows the backups on Google Traffic: Miss the totality? Google Maps will make you feel better. Me? Oh, I had decided long ago to stick around and return the next day, Tuesday. So I just had dinner and relaxed, and drove home the next day in record time, 490 miles in 7½ hours. The next good eclipse is scheduled for April 8, 2024, and it’s going to have its line of totality pass just northwest of Columbus. But as others have pointed out, the odds of getting a sunny day in central Ohio in April are pretty slim. So I’m glad I went to see this one, and I’m glad the clouds cleared appropriately. Next blog post we’ll look at my visit to Garden of the Gods. Thank you for the trip report. Especially the crescent light effects are interesting. 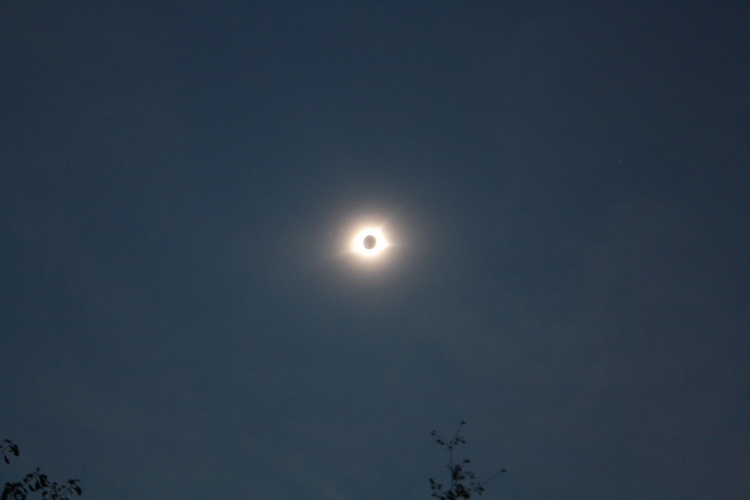 When we had a total eclipse in Germany in 1999, I missed to look out for this (mostly because we made a one-day trip by car and set up on an open meadow to watch). And yes, the sudden darkening is confusing.